Our annual sponsored walk is this year on Sunday 24th August 2014. 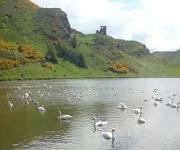 It will be held in Queen’s Park Holyrood Park Edinburgh. Assembling at the car park at St Margaret’s Loch, (Meadowbank end of park) at 13.50 – walk scheduled to start at 2.00pm and we have until 4.00pm to finish! Route: from the car park at Meadowbank entrance, to Holyrood Palace and back again, a Golden Mile! Walk, wheelchair (manual, or power), mobility scooter, and any way you can get around! Sponsor packs available from Joyce or Gordon, please help if you can, even if you are unable to take part on the day, maybe you can sponsor someone else, or help with transport. Also, if you have any family or friends who would like to take part, please encourage them to get in touch and get a pack, everyone welcome!